Welcome to the incredible Greek Island of Zante. 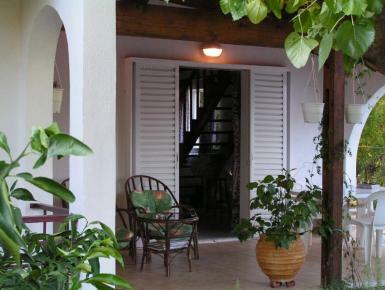 This is a characteristic 3 bedroom villa with large kitchen dinning area with capacity to accommodate six people easily. The lounge area comes complete with sofa suite, TV, DVD (many films and music disks), Play station (with many games), music system, etc. The bathroom and toilet including a washing machine also. The villa is only 2km from the centre of Laganas and about 5 minutes walk away from a restaurant where you can find a large swimming pool and a bar/entertainment area, traditional Greek dancing and local Greek cuisine each evening. We have a special arrangements with the restaurant to allow all our guests to use the facilities on site.